The similarities in Europe and the US now are all too clear. Once again the collapse of a huge debt-fuelled asset bubble in 2007 has left the private sector grappling with unmanageable debts. And similar policies to Japan of deficit spending and aggressive monetary policy has been used, with limited effect. In Europe, the problems have been compounded by a dysfunctional monetary union that slows decision making and hinders necessary economic adjustments, leading to outright depression in some countries (such as Greece). An alternative policy that has recently gained attention is “overt monetary finance”, better known as “helicopter money”. Like quantitative easing, this involves creating new money. But rather than buying assets with it, it is used to fund government spending (or tax cuts so households might increase their spending). This would guarantee an impact on the real economy. While this type of policy has historically been associated with hyperinflation, in a deflationary environment small doses could be beneficial. 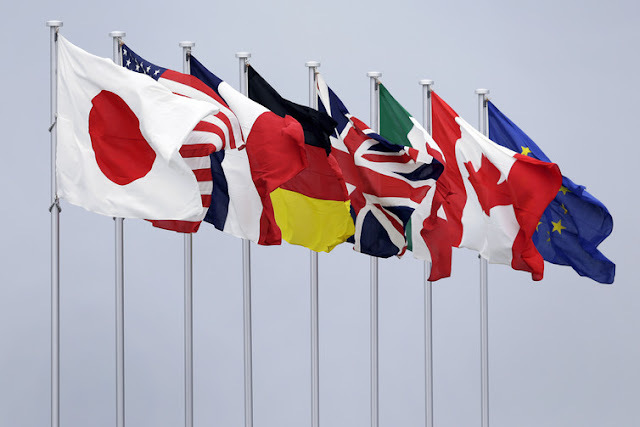 Yet, despite generating some high profile support, it is no doubt too radical for policymakers at this year’s G7. Politicians are generally more comfortable talking about structural reforms. These vary in detail but often involve making labour markets more flexible (or brutal) by reducing job security and other protections. It gives them a chance to show how “responsible” they are by taking “tough choices” and implementing “painful medicine”. But such programs have been continuously implemented for many years now, and did not prevent the financial crisis, nor help generate a recovery. Indeed, they increasingly seem to result in worsening inequality. These polices will obviously need updating for the 21st century. And they will require international cooperation. However, unlike other global problems such as climate change, the proposals outlined here do not require full international cooperation. The G7 acting together would be enough to make a huge difference. But it does require a change in the dominant ideology that binds these “like-minded countries” together. The rise of presidential hopeful Donald Trump in the US and the far right in Europe are a warning sign of what might happen if they don’t.